Olympia LePoint appears LIVE on KTLA Morning News, in Los Angeles, to speak about her experience as a Rocket Scientist ” Modern Day Hidden Figure” and speaks of the importance of teaching the youth STEM education, and critical problem solving. Over 1 Million viewers watched this morning episode broadcast live. Olympia LePoint appears LIVE on the CW Network’s “San Diego Living” Morning News, in California, to speak about her “Formula for Success” and her book Mathaphobia. She shares of her upcoming talks at universities. Over 1.5 Million viewers watched this morning episode broadcast live. Olympia LePoint appears as a celebrity scientist on Impact Theory with Tom Bilyeu. Over 2 Million people watched the episode, and clips of this episode. Olympia LePoint appears LIVE on CBS News as a rocket science expert speaking about a surveillance satellite launched from Vandenberg Air Force Base. Nearly 1 Million viewers watched this broadcast live. Olympia LePoint appears LIVE on KTLA Morning News, in Los Angeles, to speak about the newly discovered solar system Trappist-1 and gives information on her new podcast, “Answers Unleashed.” Over 3 Million viewers tuned in to the live segment. Olympia LePoint appears as a celebrity scientist in People Magazine. Visit the News online by clicking HERE. Olympia LePoint appears on “Open Mind” on the Gaia TV Network to speak about her book Answers Unleashed: The Science of Unleashing Your Brain’s Power.Over 2 Million viewers watched this episode broadcast through the Gaia TV network..
Olympia LePoint appears on CBS News in Los Angels to speak about the new technology of the Falcon 9 Rocket launched by Elon Musk’s company Space X. Over 2 million viewers watched this live news segment. Olympia LePoint appears LIVE on CBS News, in Los Angeles, to speak about Space debris falling out the sky from a Chinese Space Station. Over 2 Million viewers watched this nighttime news episode that was broadcast live. Olympia LePoint appears LIVE on Cheddar TV to speak about her experience as a “Modern Day Hidden Figure” coined by People Magazine, speaks about SpaceX and Blue Origin aerospace companies, and her TEDx Talk ” Reprogramming Your Brain to Overcome Fear.” She also speak of the actresses seen in the movie Hidden Figures. Over 1.5 Million viewers watched this morning episode that was broadcast live. Olympia LePoint appears on Motivation2Study with the Impact Theory with Tom Bilyeu. Nearly 1 Million People watched the web short film, within the first 3 months of its debut on Youtube. Olympia LePoint appears LIVE on NBC News, in Los Angeles, to speak about her book Mathaphobia: How You Can Overcome Your Math Fears and Become a Rocket Scientist. Over 2.5 Million viewers watched this afternoon news segment that was broadcast live. 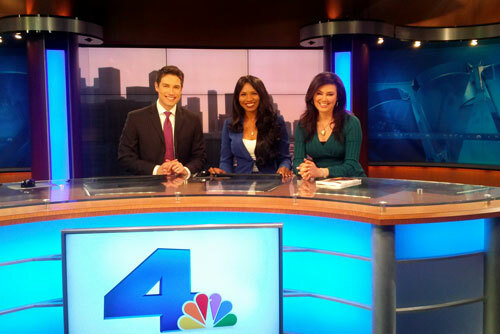 Olympia LePoint appears on KCAL News in Los Angeles to speak about her book Mathaphobia. Over 1/2 Million viewers watched this afternoon segment that was broadcast live.